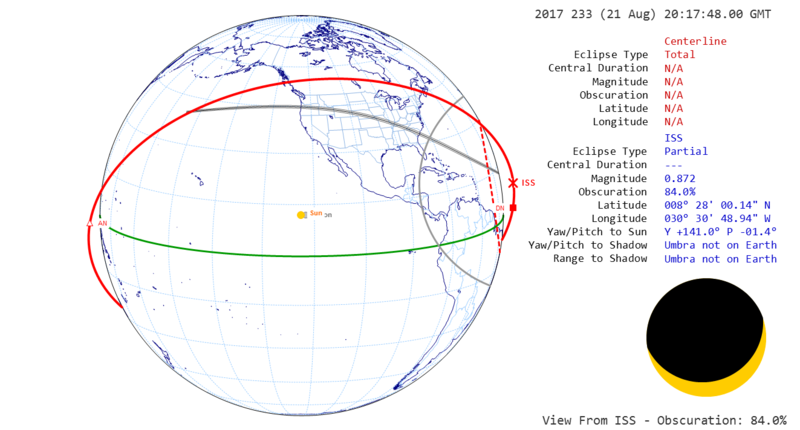 The station crew will have three chances to see the solar eclipse from space. The third pass will offer the most coverage with the sun 84% obscured by the moon. The Expedition 52 crew wrapped up a busy week on Friday with more science work, cargo unloading and cleanup after a Russian spacewalk on Thursday. They are also busy preparing for the 2017 Total Solar Eclipse on Monday with the chance at several unique views of the event. The crew participated in several studies including Vascular Echo Ultrasound, a Canadian Space Agency investigation that examines changes in blood vessels and the heart while the crew members are in space. They also completed weekly questionnaires for the ESA Space Headaches investigation which collects information that may help in the development of methods to alleviate associated symptoms and improvement in the well-being and performance of crewmembers in space. Russian cosmonauts Fyodor Yurchikhin and Sergey Ryazanskiy performed cleanup tasks following their Thursday spacewalk which lasted seven hours and 34 minutes. 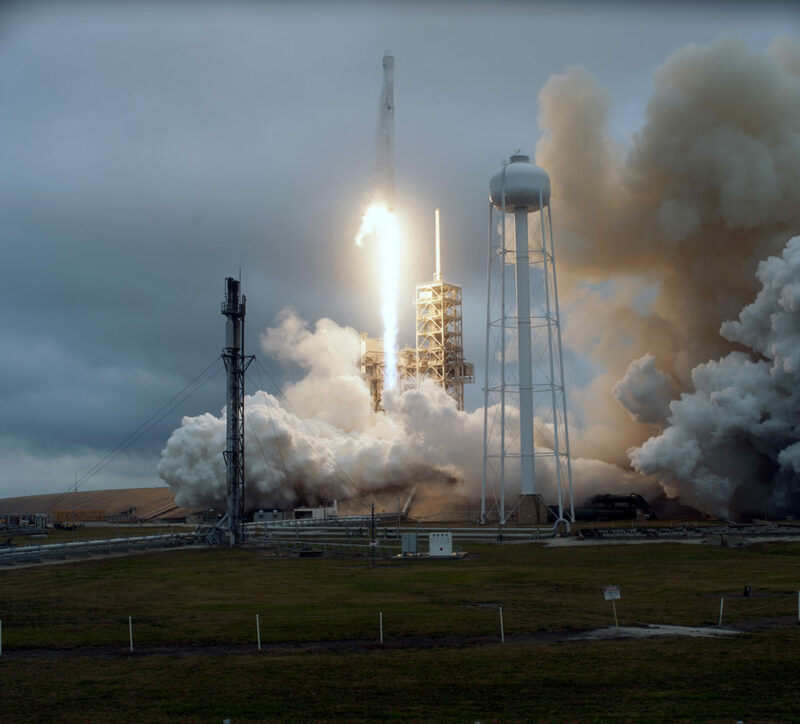 The duo completed a number of tasks including the manual deployment of five nanosatellites from a ladder outside the airlock. Station crew members will have their cameras outfitted with special filters on Monday for three chances to photograph the solar eclipse from windows aboard the orbiting laboratory. For more information on their opportunities and what they expect to see, visit NASA’s Solar Eclipse website. The three Expedition 50 crew members today are working to unload cargo and set up new computer servers onboard the station. In Kazakhstan, the next trio to launch to the International Space are continuing their final prelaunch preparations. Commander Shane Kimbrough completed work on Wednesday on the Oxygen Generation System (OGS) in the U.S. side of the International Space Station. The OGS was down for maintenance as he and ground specialists troubleshot the device due to a low voltage signature. Teams in Mission control conducted checkouts of the system today and reactivated it successfully, enabling OGS to once more supply oxygen to the space station crew. Final checkouts on the system are on the plan for Friday. Today, Kimbrough set up new laptop computers to allow ground specialist to load required software. He also unloaded additional cargo from the attached Orbital ATK Cygnus cargo craft. Cosmonauts Sergey Ryzhikov and Andrey Borisenko performed routine maintenance on the ventilation system inside the Russian segment and took part in the Pilot-T experiment, which assesses the cosmonauts ability to perform complex tasks at different points during their spaceflight. Three new station crew members are in Kazakhstan preparing for a Nov. 17 launch to the station. 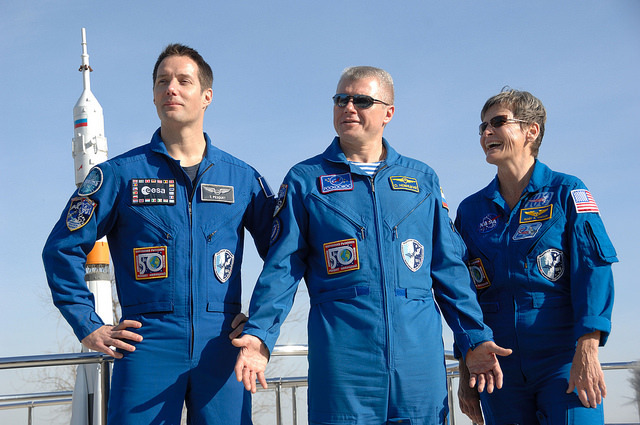 Veteran station residents Peggy Whitson of NASA and Oleg Novitskiy of Roscosmos, along with first-time space flyer Thomas Pesquet of the European Space Agency will take a two-day, 34-orbit trip to the station after their liftoff and stay in space till May. The group reviewed flight plans and took part in traditional preflight events, including a media day and the ceremonial raising of flags and planting of trees. NASA astronaut Jeff Williams opened the hatch to the Bigelow Expandable Activity Module (BEAM) at 4:47 a.m. EDT Monday, June 6. Along with Russian cosmonaut Oleg Skripochka, Williams entered BEAM for the first time to collect an air sample and begin downloading data from sensors on the dynamics of BEAM’s expansion. Williams told flight controllers at Mission Control, Houston that BEAM looked “pristine” and said it was cold inside, but that there was no evidence of any condensation on its inner surfaces. The crew of Expedition 46 was engaged in a variety of repair tasks today across the orbiting laboratory. 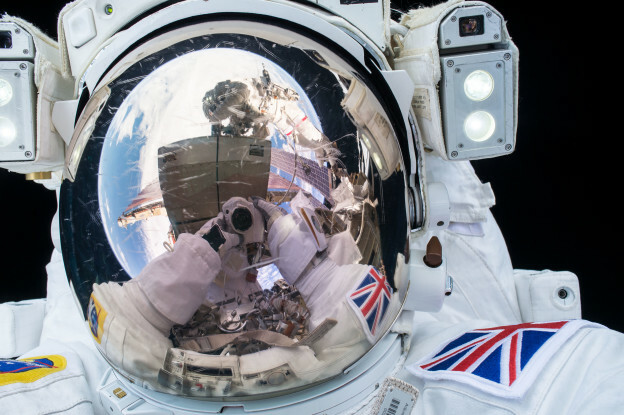 ESA astronaut Tim Peake replaced cables in the station’s Advanced Resistive Exercise Device, the primary tool for astronaut resistive exercise vital for maintaining bone and muscle mass while in microgravity. NASA astronauts Scott Kelly and Tim Kopra worked to replace key components in the station’s Water Processing Assembly. Peake also set up units for the NASA Space Automated Bioproduct Laboratory (SABL), which is capable of supporting life science research on microorganisms, small organisms, animal cells, tissue cultures and small plants. Meanwhile, Scott Kelly and Mikhail Kornienko are just one week away from the conclusion of their one-year mission. The pair are set to land in Kazakhstan at 11:27 p.m. EST March 1. 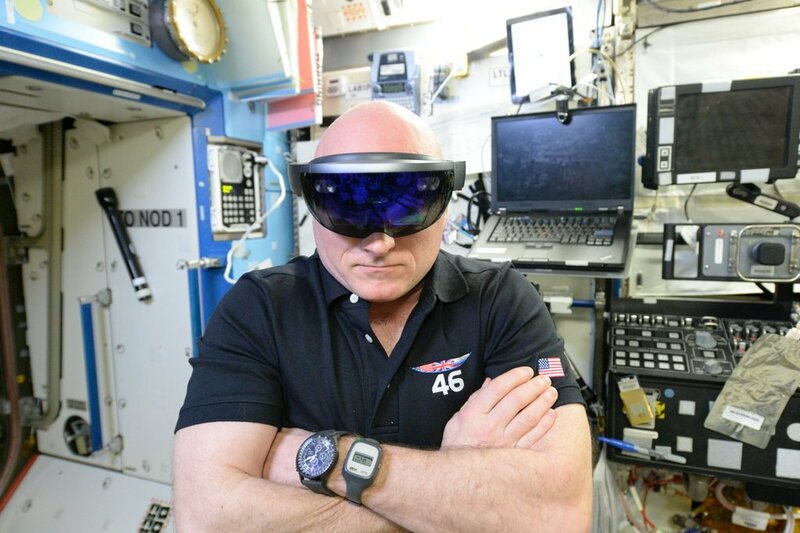 NASA astronaut Scott Kelly performing checkouts for NASA’s Project Sidekick, which makes use of Microsoft’s HoloLens device. 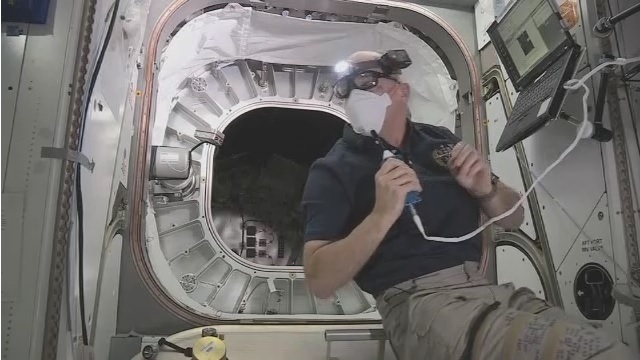 Over the weekend, Expedition 46 commander Scott Kelly worked with ground controllers to successfully checkout the Sidekick device and internet connectivity. The project, which makes use of Microsoft’s HoloLens device, aims to enable station crews with assistance when and where they need it. 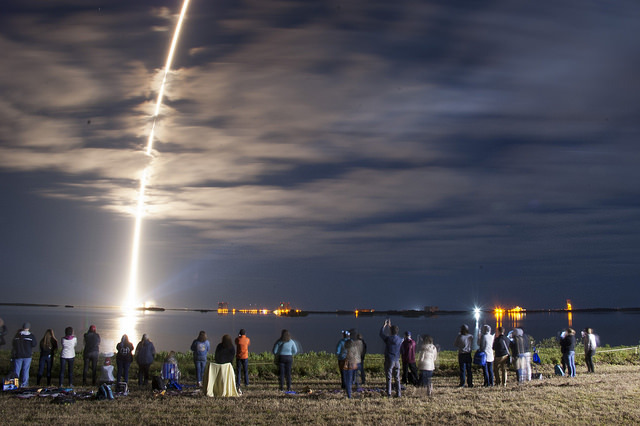 This new capability could reduce crew training requirements and increase the efficiency at which astronauts can work in space. Also on Saturday, Orbital ATK’s Cygnus resupply vehicle successfully deorbited at approximately 10:53 a.m. EST. The crew engaged in a variety of scientific experiments on Monday, including research into colloidal structures vital to the design of advanced materials, human research on astronaut heart health and overall body changes, and protecting human fitness during long-duration spaceflight. 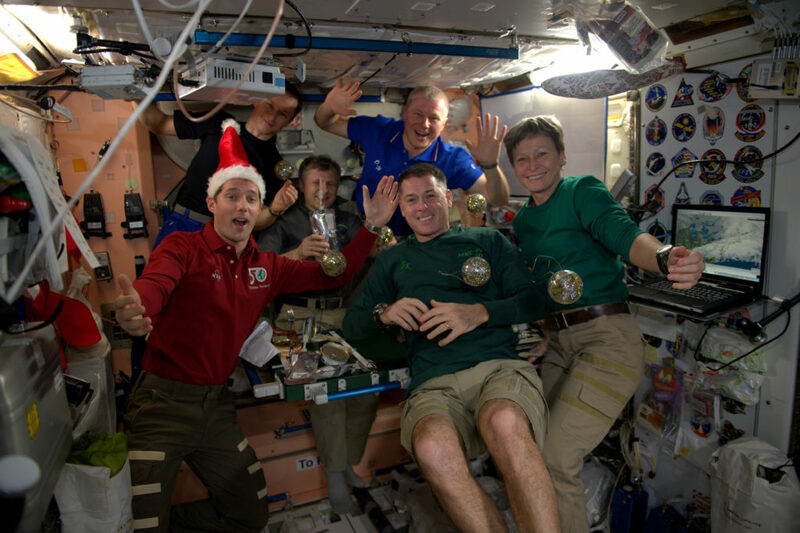 Kelly and his fellow Expedition 46 crew mates Mikhail Kornienko and Sergey Volkov are continuing to prepare for their landing on March 1, U.S. time. 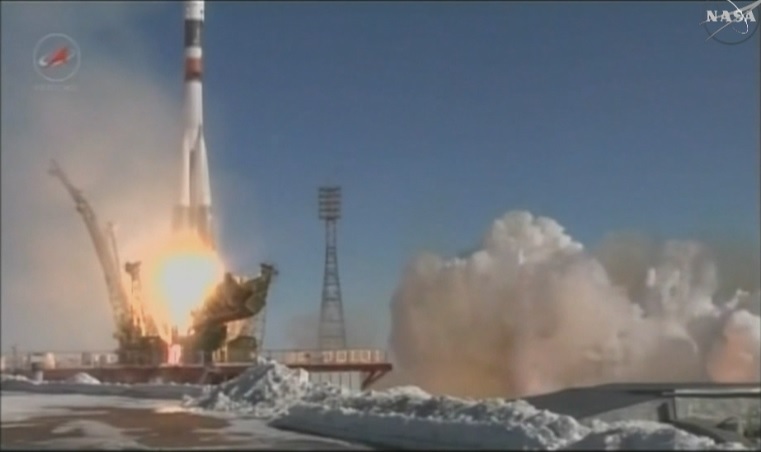 The landing will wrap up Kelly and Kornienko’s yearlong stay in space.